Mainstream media outlets are echoing a report that the fast food giant Chick-fil-A has allegedly ceased its donations to anti-gay organizations and causes. In reality, the majority of the company's anti-gay donations remain unchanged. This past week Chick-fil-A shared with me the 2011 IRS Form 990, filed in November for the WinShape Foundation, along with 2012 financials. The IRS has not released the 990 to the public yet, but the financials affirm Chick-fil-A's values a year prior to the controversy this past July... The funding reflects Chick-fil-A's promised commitment not to engage in "political or social debates," and the most divisive, anti-LGBT groups are no longer listed. 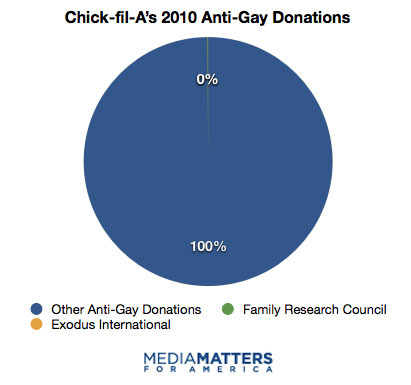 But even if Windmeyer's claim that Chick-fil-A has stopped funding the most extreme anti-gay groups is true, the company would only have reduced its anti-gay donations by less than one percent. As Equality Matters reported last year, Chick-fil-A donated $1.9 million to anti-gay groups in 2010 alone through WinShape Foundation. The majority of that money went to groups like the Marriage & Family Foundation, the Fellowship Of Christian Athletes, and the National Christian Foundation. Windmeyer clarified in an interview with The Advocate that when he saw IRS tax forms last week, provided to him by Chick-fil-A officials, that several of the groups identified by Equality Matters are still indeed receiving donations. Those groups include the Marriage and Family Foundation, National Christian Foundation and the Fellowship of Christian Athletes. What Chick-fil-A was attempting to highlight by showing Windmeyer the tax documents from 2011 is that it had stopped giving to what it considers more activist groups such as Exodus International, which had practiced so-called "conversion therapy," and the Family Research Council, which is labeled by the Southern Poverty Law Center as a "hate group." Chick-fil-A is not ending the bulk of its anti-gay giving. Chick-fil-A is not implementing any LGBT-inclusive policies like nondiscrimination protections, of which it has none. And Dan Cathy is not apologizing for his vitriolic comments -- in fact, he's making no public comments of his own whatsoever. In other words, the company is doing nothing to improve its atrocious record on LGBT issues. Cathy's opening mind for friendships with gay people is commendable, but does not justify Windmeyer's blessing of Chick-fil-A franchises on college campuses in the face of protests from LGBT student groups.